MapTools is the world's leading manufacturer of coordinate plotting tools. Our products are in daily use by many federal, state, and local land management agencies, along with military, law enforcement, and search and rescue teams around the world. Recently we have been getting more inquiries about using our tools with USNG (United States National Grid) Coordinates. All of our tools that measure UTM coordinates, will also measure USNG. 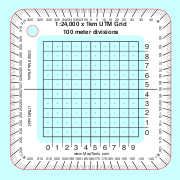 The USNG grid system is built on top of the UTM coordinate system. They will also work with the Military Grid Reference System, which is very similar to USNG. Learn more about USNG with our USNG Tutorial. MapTools can now make you a customized map ruler for any scale map. MapTools produces grids, corner rulers, roamers, and rulers to assist with plotting or measuring positions on many different map scales. Tools for both UTM/MGRS/USNG and Latitude/Longitude coordinates are available. If you are already an experienced map and GPS user, you have come to the right place to get professional quality plotting tools. You'll want to jump directly to the pages describing the tools. If you are a new map coordinate or GPS user, you will want to visit the tutorial pages for an introduction to geographic coordinate systems. Or check out my book, "Using UTM Coordinates with your GPS"
In addition to the coordinate plotting tools designed by MapTools, I sell other useful products that I personally use and find to be useful additions to my navigation and mapping tool kits. I've run across a lot of people who are convinced that traditional navigation skills using a map and compass are the only way to go. They are not ready to trust a GPS receiver. To them, I would offer the following analogy. Just because your car could breakdown doesn't mean you should always walk. It does mean that you shouldn’t forget how to walk. A GPS receiver is hands down the fastest and most accurate way to determine your location on a map. It will work in many conditions where using a compass to find your location is difficult or impossible; such as darkness, and reduced visibility environments. Like most tools, to make good use of a GPS receiver some specialized knowledge is required. A GPS receiver is no substitute for good traditional navigation skills. You still need a good map, along with the skills to use it. Most likely, you will still want to carry a compass and the knowledge to use it. The tutorials on this site and the classes I teach, strive to find a balance between traditional skills and modern ones. If you are a GPS "refusenik", I hope you will reconsider. I also teach a Wilderness Navigation Class at West Valley College, in Saratoga, CA for the Parks Management Department. If you live in the San Francisco Bay Area this is a great way to learn or improve on your navigation skills.